Russell Young’s Dirty Pretty Things focuses on one history’s most influential celebrities:Marylin Monroe.Young captures the depth of her pain in “Marilyn Hope”, while adding glamour through diamond dust. Russell Young began to use diamond dust in 2007, pressing the crystals into the enamel of the paintings. Young was drawn to the opulence of the light, shimmering off the multifaceted glass. Russell Young is a pop artist of international acclaim. Russell Young’s art is larger than life silkscreen paintings of images from history and pop culture. Russell Young hones the quality and texture of the original image and then enlarges to an uncomfortable size. Color plays a key role washing Russell Young’s subjects in faded pinks, yellows, blacks, silvers and blues. Russell Young was born in 1959 in Northern England. From an early age, Young was drawn to the quintessential “American dream,” which he thought represented freedom and possibility. He eventually developed an interest in photography, and studied photography, film, and graphic art at the Chester Art College. Young’s first photography job was under Christos Raftopoulos, who eventually pushed Young to take on projects of his own. Young started at the live club shows of Bauhaus, R.E.M. and the Smiths. The talented photographer quickly picked up work for magazines, shooting portraits of Morrissey, Bjork, Springsteen, Dylan, New Order, Diana Ross, Paul Newman and many other celebrities, as well as directing one hundred music videos during the glory days of MTV. Several series have followed Pig Portraits, including Rebel Rebel, Shoplifters of the World Unite, Dirty Pretty Things, Bankrobber, American Envy, Only Anarchists are Pretty, and others. 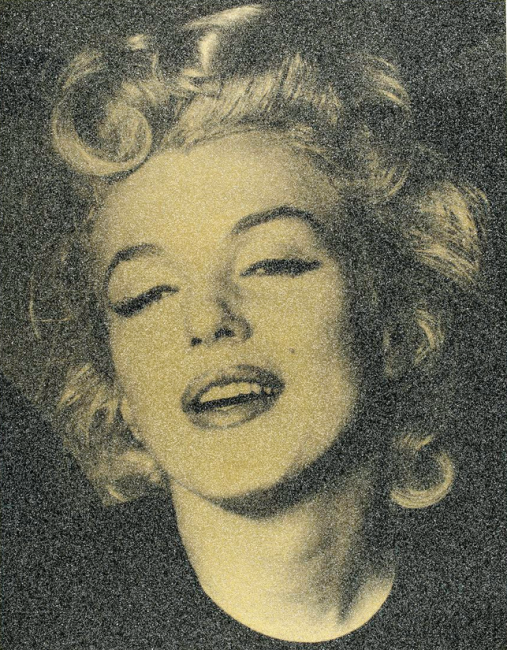 In addition to recognition for his iconic images, Young is also acknowledged for his use of diamond dust. He began using this technique in 2007, pressing the crystals into the enamel of the prints. No two diamond dust pieces are exactly alike, as the crystals are applied individually to each work. Young’s Marilyn Monroe diamond dust pieces continue to reach new highs at public auction. His pieces have graced the auction block at Sotheby’s, Christie’s, and Phillips de Pury in both the United States and the UK. Russell Young lives and works on the California coast and in Brooklyn, New York. His work has been shown in London, Paris, Berlin, Tokyo, Singapore, New York, Detroit, Miami and Los Angeles. His works are in acclaimed collections such as the Balthazar Getty (of the Getty Museum), Abey Rosen, Barack Obama, Brad Pitt, and more.